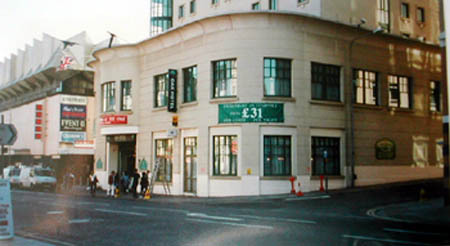 This photo shows the “Oak” Hotel in West Street. This was the first building to be built on this site of the old Sports Stadium after its demolition in 1965. The hotel is built in the “Art Deco” style and the interior has the sleek lines of a 30’s transatlantic liner. Did Charles II stay here? Ironically this site was home to the “George Inn” in the seventeenth century, reputedly where Charles II stayed on his escape to France. For many years after a branch of oak was hung out through a top window each year to celebrate his stay there. Later the Inn changed its name to the “Kings Head” and demolished in the 1930’s. In 1934 the Swimming Stadium was opened on this site with its “Art Deco” exterior and interior built to resemble a transatlantic liner! Coincidences!